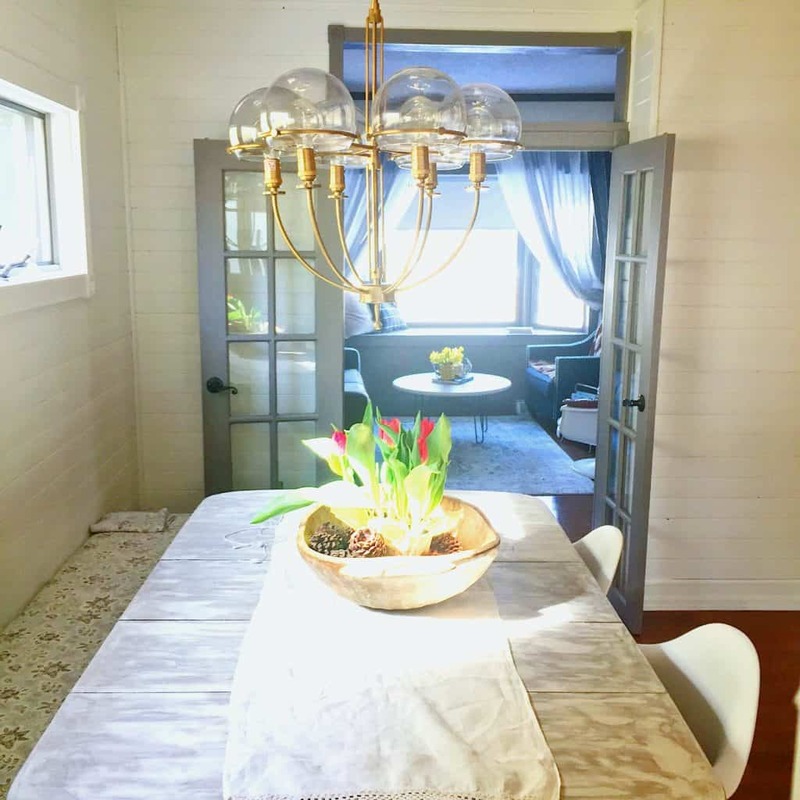 This post about choosing light fixtures for small spaces is written with mutual support between Lamps Plus and NellieBellie. They are giving us perk for spreading the word about their fabulous selection of lighting and home decor! Small homes can feel as if they are limited with design and decorating function. To live in a small home comfortably, you need to limit the number of belongings you bring into your home. It can be a bit underwhelming to decorate a small home when you need to keep the clutter down and only have limited space to make a design impact. Do not let that make you anxious, make you feel that you need a larger home to be happy, or that you need to buy more objects for your small home. Small homes can be utterly gorgeous and one of the simplest ways to achieve major impact is with lighting. a fairly inexpensive way to add great style to a small space. you can find great stylish options on a small budget. It is exciting how much impact the design of a light fixture can have on a room. But, it can be equally daunting. 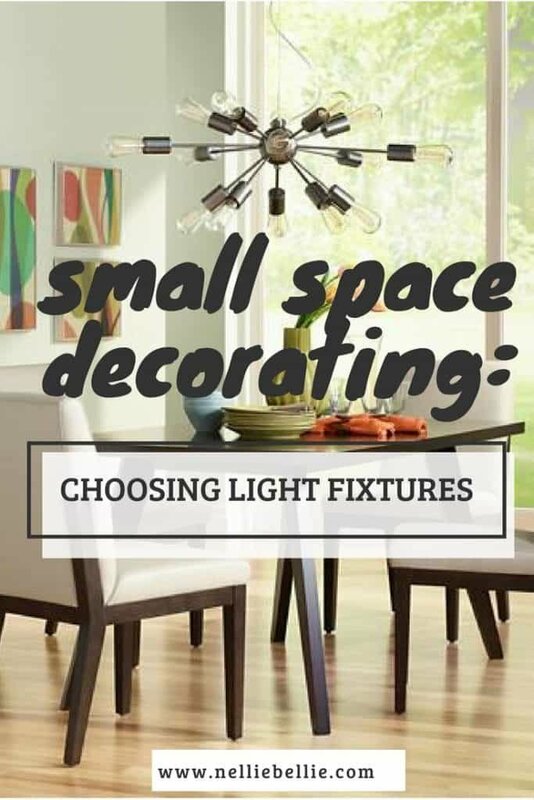 When choosing light fixtures for a small space, think carefully about the feeling you want from the room and use the design of the fixture to capture it. This is a great opportunity to reflect your farmhouse style or your love of industrial design. Perhaps you want a minimalist approach to your decor? Use lighting to help reflect that design. Using lighting to help style your room will minimize the number of objects you feel the need to decorate with. A big impact in a small way! Filter out all of the fixture design styles you don’t want in your room to help narrow down your search. This is my dining room nook that we just finished updating. 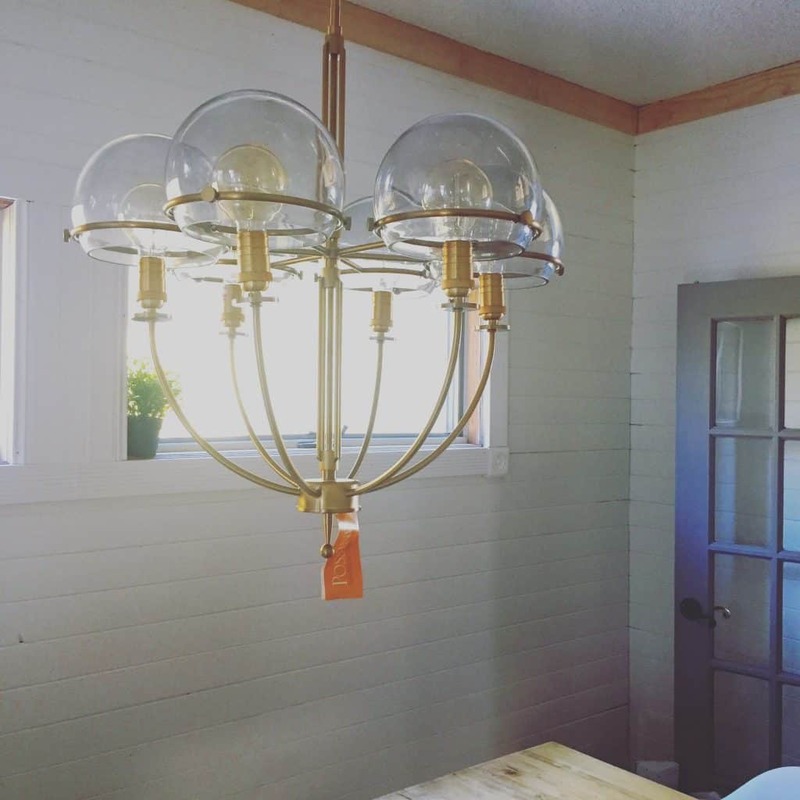 I chose the Phileas Chandelier for a vintage, nostalgic feel but still transitional. I wanted this room to have a quiet elegance that was comfortable to be in, pretty to look at, and as functional as possible. This chandelier from Lamps Plus gives a nod to the lighting from the 1880’s (when the house was built) without being too vintage or fussy. It also has just the right amount of uniqueness for my eclectic tastes. 2. Ruling out options with the wrong light quality. Light is ultra important in small spaces. It can make a space feel bigger and brighter or smaller and duller. It can feel cold, warm, or like a department store fitting room. Filter out all of the choices that don’t have the kind of bulbs you want to use. Think about how bright you want the fixture to be and how many bulbs (and even what wattage) the fixture would need. A 2 bulb fixture might be perfectly fine for a bathroom but be entirely insufficient for a kitchen island. Also, what sort of shades or covers does the light have? Will it diffuse too much light or let enough out? These are all things to decide BEFORE starting your selections. Make choices about light quality to further filter your choices and get you closer to the correct fixture. In the room in the above picture, there is only a single light fixture, little natural light, and it is quite dark. I wanted to have as many bulbs as possible for the size I needed and capture as much light as I could. This is why I only looked at lights with clear globes, 60 watt or larger bulbs, and over 5 bulbs. After narrowing this and the style down I had fewer options to choose from and was feeling a bit less overwhelmed. Small rooms can easily feel cluttered and full if you put large pieces of furniture in them. Filling every available space with belongings can have the same cluttered effect, and picking a light that is the wrong shape and material can create that same filling of clutter. You can quickly make a room feel small and uncomfortable simply from the light chosen. A large chandelier in a small dining room, although impactful, can quickly become annoying and uncomfortable. A round light over a rectangular table can make it more difficult for some guests to maneuver around. The same is true for a low-hanging light in a space with heavy traffic, which can give a feeling of closeness. Another thing to think about, in a light fixture, is if the shape is open or closed. Meaning: does it allow light and visuals to pass through or does your eye rest on it before moving past? For example, a legged coffee table would be open while a chest coffee table would be closed. In small space decorating, you are often told to try not to have too many of your furniture pieces boxy and heavy but rather to give them legs and feet that allow for space underneath. This gives the illusion of more space. The same is true for lighting. You can give the illusion of space by choosing fixtures with materials that feel light in weight, reflective surfaces, and “leggy” shapes to give more space to the room. Choose materials that feel heavy in weight or appearance to create a fixture that creates impact for the room. The light I chose in the photograph above is difficult to photograph for the very reason I chose it…it’s reflective, open, and pass-thru. It doesn’t command a lot of space in the room and easily allows your eye to move beyond it. These type of fixtures are great for small spaces. If you know if you want your light to command the space in your room (make it the design feature) or not, you can filter out the shape and material of the fixture options accordingly. Just as the shape makes an impact on the feeling of a space, so do the materials. Materials that are reflective and clear tend to be the best for small spaces because of their ability to either bounce light or allow light to pass thru. Brass, silver, gold, and clear are all examples of these materials. Materials that absorb light can be useful in making a space feel more comfortable and homey. They are also good materials for “statement” light fixtures. Those would be the light fixtures you want to do most of the design work in the room. Materials like iron, wood, and plastic are often examples of this. The dining room above has an iron fixture with a bit of light passing through. This fixture has more impact in the room than the brass one I chose for our dining room nook. If there wasn’t any light passing through at all it would have even greater impact. If you know which purpose the material of your fixture should have you can use this to filter out those choices that aren’t going to work for your space. Now go forth, grab great lighting, and make your small home utterly gorgeous! You got this! Be sure to check out Lamps Plus first! I moved into a new apartment a few weeks ago and I am trying to find fun home decor for the living room, so I appreciate the tips in this article about how to choose light fixtures! You make a great point that I should look for light fixtures that have great lighting quality because this way I will only need one fixture to brighten up the room. Also, it makes a lot of sense that if I choose a fixture that has a reflective surface and is a light color, it will help to make the room feel larger and create more space. This would be a huge benefit for me because my living room is pretty small.